Just a couple of months ago we sounded the alarm to defend net neutrality, a fundamental principle of the Internet that guarantees our online freedoms, in Europe. The threat comes from the role of the EU countries, including Spanish government, vassal of the telcom lobbies, and MEPs like Pilar del Castillo, the rapporteur of the European Parliament on this issue. The situation is urgent. Negotiations on Net neutrality might end in June, after the third trialogue on June 2nd. We can not let that happen. We must lobby from the civil society so that the rights and interests of the citizens and innovation are upheld and insted of create funels by and for the big monopolies. After the historic decision of the US to legally protect Net neutrality as a public good, we can not let the Internet be prioritized and discriminated by private companies in Europe. We need all the help to spread this campaign to ask our MEPs to defend Net Neutrality and a real Internet for everybody, instead of the internet wanted by Pilar del Castillo, some member states like Spain or the phone companies – a discriminatory and restrictive Internet which would become just a tool for those who can afford to pay it, a monopoly that leaves us with the rest of us with a second-class semi-Internet. Xnet, together with other European organizations fighting for the defense of the Internet, have set up the following tool to contact the MEPs and ask them to save internet https://savetheinternet.eu/es/ to prevent the democratic decision of the European Parliament on April 4th, 2014 from being undone through opaque and undemocratic mechanisms such as the trilogues. The Interet Service Providers to intervent and manage traffic on exceptional or temporary situations, but those situations are not sufficiently well specified, leaving room to the ISPs to act at its discretion. Service providers and cable companies could offer payment services ad hoc at a higher speed, relegating regular access to the service to be overlooked and outdated and hence to be discriminated. Both examples are in tune with the policy of “Net Neutrality yes, but…” from Pilar del Castillo. On the other hand, the text tries to focus all the attention on roaming, a far more consensuable issue, as a smokescreen. However, both are important. 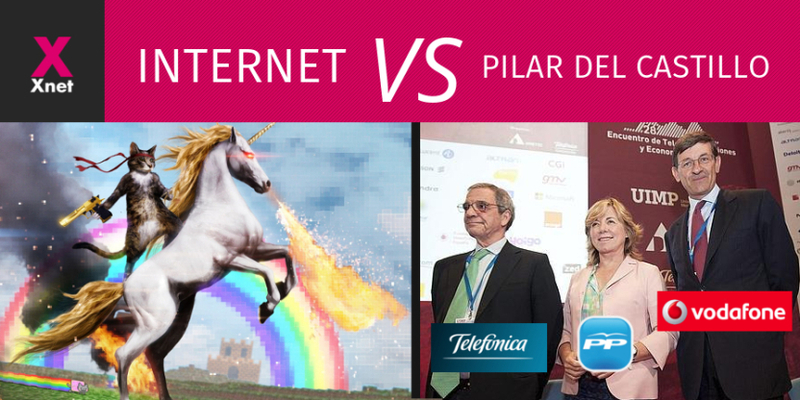 We believe that Pilar del Castillo will not defend Network Neutrality in Europe, having repeatedly shown their willingness to sacrifice it, to the detriment of the rights of the citizenship and for the interests of the telecom lobbies, as she always has. It should be allowed for the ISPs to give priority to certain traffic (eg YouTube) before that of everyone else. It should be allowed to degrade different types of traffic (eg P2P), discriminating them against other kinds. Even more alarming is that Pilar del Castillo is responsible for the Patronato de la Fundacion España Digital, the foundation that was created by ASIMELEC, the patronal of the telecoms. How can anyone representing the lobby of the telecoms be in charge of deciding between an Internet for the telecoms or for the people? Are there not red lines in the European parliament for the incompatibility between public and private activity? Is it not clear which interest Pilar del Castillo will defend? – She is among the 10 less active MEPs. This contrasts with its great activity to defend the private interests of large lobbies she is working for. – She combined this inactivity as a representative of citizens with intense relations with Telcoms, with the pathological gambling lobby or the board of the FAES Foundation. – Everyone remember her as the responsible for tearing apart the public university when Aznar was on the government. She managed and approved the LOU law against the criterion of all experts, stakeholders and citizenship and in favor of private interests. – She can also boast fomr being responsible for other contributions to Spanish culture like contributing with 125,000 euros of public money to the Francisco Franco (Sanish dictator) Foundation. – Her PhD thesis was on the financing of political parties and subsequently she was listes as beneficiary in the Bárcenas papers on the illegal financing of the Popular Party. We, the citizen networks fighting in Europe to defend Internet, see how they are doing everything in their hands to satisfy the interests of those who believe that the Internet should be a trade good owned by the ISPs and not a public good owned for the people. We also have no doubt that things have changed over the years and now the citizens are the most powerful lobby. Help us make it clear who is NOT in favor of net neutrality, like Pilar del Castillo, and to put pressure to the rest of MEPs to be to side with the people. Its time for the MEPs to chose a side: either with the people or with the telcos such as Telefonica or Vodafone. Visit https://savetheinternet.eu/es and contact your MEPs.